Want to be the envy of all of your friends on your next camping trip or sleep over? 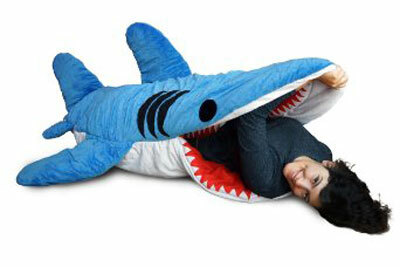 Bust out the Chumbuddy shark sleeping bag and watch their jaws drop. That’s right, something super cool and fun and useable, AND sized for an adult. Your blue shark shaped chumbuddy will appear to be ingesting you once you crawl in for the night. Did you remember to bring a pillow? No need, your blue finned shark sack features a detachable dorsal fin pillow for your sleeping comfort. Snooze the night away nestled safely in the jaws of your new camping pal. Each shark sleeping plush is made by hand and, one imagines, with love. The fabric is a poly/cotton blend and the fill is polyester fiber. Chum is pretty large and will need more room than the average sleeping bag. However, not only is he awesome and fin-tastic, he also doubles as a lounge chair when you’re not asleep. Dang, I sure hope someone knows this would make an exceptional gift for the shark lover in your life (hint hint).